On Monday afternoon, the excitement must have shown on my face because Elizabeth asked me, "Have you ever been more excited about anything?" Did she really have to ask? Monday evening was just a quick orientation at L.A. Burdick's. Six of the ten people came to the optional gathering where we met our leader, Michael Klug, introduced ourselves, got a quick rundown of the daily schedule and a tour of the facility. Needless to say, after several chocolates and all the excitement, I couldn't sleep for all the flavors dancing in my head. Seven am came early so I drowned myself in Diet Mountain Dew and made it to Walpole in time for a croissant and some freshly squeezed orange juice. It was the best croissant I have ever had. 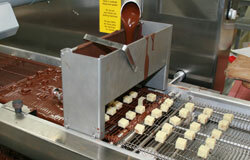 At 9am we all went over to the factory for a day of making ganache, a mixture of chocolate, cream and flavorings. Our first batch was a dark chocolate ganache with pear brandy and red pepper. My ganache broke because my cream was too cold by the time it was my turn, so Cassandra, one of the Burdick's chocolatiers, helped me right the situation by using a hair dryer to heat the mixture while it spun around in the food processor. Cool trick. Our second batch was a dark chocolate ganache with pistachios, lemon grass, and orange zest. Yum. No problems the second time around. The third batch was my own recipe -- white chocolate ganache with rum and spicy candied pecans made with cinnamon, nutmeg, cardamom, cloves, and ginger. All three batches went into the cooler for a rest. We get to cut and enrobe the ganache fillings on Thursday or Friday. Michael demonstrated how to make an egg-based dark chocolate ganache with sour cherries that can be used to pipe shapes like their penguins, mice, and bunnies. All ten chocolate campers seem to have one thing in common -- we are all foodies. 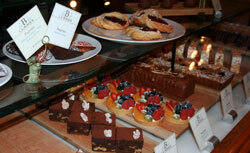 Talk of food blogs and food websites and food suppliers is constant. I can't go anywhere without a pen and paper for fear of missing someone's favorite something-or-other. After a long day, six of us had an early dinner at the Burdick's Restaurant and went home to crash (and write our blogs.) Photos tomorrow, I promise. Day 2 began with another perfect croissant after which we started our lesson on tempering chocolate. Internet cooks would have you believe that tempering chocolate is pretty easy, but it seems there are many ways to go wrong and an accurate thermometer and attention to detail is the key. Here's the short version of what Michael calls the Block Method. 1. 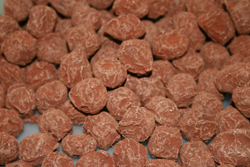 Slowly heat a couple of pounds of finely chopped dark chocolate in a stainless steel bowl over a dry heat source on low. We used electric chocolate tempering pots, but Larry Burdick started with a 200-watt light bulb mounted in a plastic bucket over which you place the bowl of chocolate. For home use someone recommended a crockpot. I am going to try putting the bowl of chocolate in my electric frying pan because it has a dial with specific temperatures on it. Michael Klug implored us not to use any sort of water bath method of heating the chocolate. 2. When the chocolate is melted and around 45 degrees Celsius, add a few cups of FINELY chopped chocolate, stirring gently to incorporate the chocolate and cool the mixture off-heat until it is about 36 degrees Celsius. 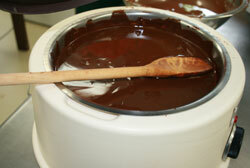 Then add a large BLOCK of chocolate and continue stirring until the mixture drops to about 32 degrees Celsius. 3. Place over low heat to maintain a temperature of about 31-32 degrees Celsius stirring every couple of minutes. Now it is ready to use. It should work well for about an hour or two. When it begins to thicken you will need to go through the tempering process again. 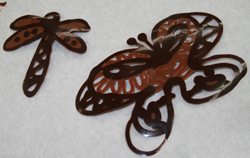 Once we tempered our chocolate, we began working on making molded chocolate bunnies. 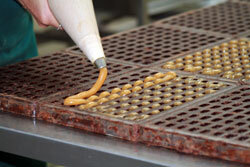 First we brush on some white and milk chocolate to decorate the molds in certain areas. After letting it chill completely, we brushed the entire mold with dark chocolate, let it chill again and then painted on a thicker layer of dark chocolate and chilled it for a third time. Then we cleaned the edges of the molds, clipped the two halves together, filled it with tempered chocolate, dumped out the chocolate and place the base of the mold on a bed of chocolate to form the base and threw them back in to the cold room. In the afternoon we whipped the dark chocolate cherry ganache and piped the classic Burdick's mice on to parchment paper lined with small disks of chocolate that was painted on to the paper. 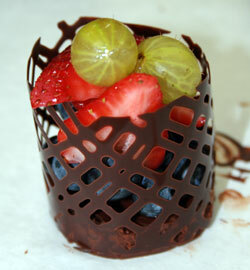 Piping needs to be done quickly or the heat of your hand will melt the ganache. The last 15 mice I made sort of fell in to small chocolate pools because the ganache got too warm. After adding the almond ears, we sent the mice to be chilled and began working on assorted chocolate garnishes for the afternoon. I had dinner with Julie, Kathy, and Beth Elaine again. Cassidy and Zoe, who joined us last night, were having dinner with Zoe's father. We had a raucous time, great food, and the best creme brulee ever. Today began with cutting our custom made ganaches into shapes, retempering our chocolate and dipping some of our bonbons my hand. 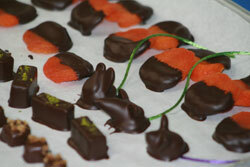 We also dipped apricots, lemongrass-orange bonbons and the mice we piped yesterday. It took all morning to dip one tray of candies. Now we know why they have 4 separate machines that do it for them when they do batches for the chocolate shop. We watched one of the women piping the honey truffles into small molds. 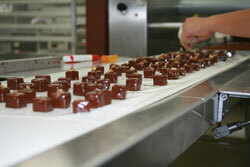 Burdick's is all about the handmade chocolates, but the honey truffle center is liquid, so they must use molds. It is the only molded bonbon they do. 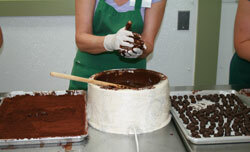 We went to Fat Franks hot dog stand for lunch and spent the afternoon hand-rolling our Poire Williams truffles. First rolling the ganache into about two hundred tiny truffles per person, coating them with chocolate, literally by hand. Then we applied a second coat of chocolate by hand and rolled them in a cookie sheet full of cocoa powder where they will rest overnight. While we were truffling, the kitchen staff was putting the rest of our cut ganache through the enrober, because we never could have finished them by hand. The cute little white cubes going through the machine to the right are my Candied Pecan bonbons. My bonbons caused a little jam up on the enrobing machine, but one of the employees made a quick adjustment to the machine and voila we were back on track. So we are wrapping it all up today — literally. How will I ever go back to my old life after this? The morning began with a tasting of our Poire William truffles. After their overnight rest in cocoa powder, David scooped them out with a kitty litter shovel — brilliant idea — and put them in boxes. These were a big hit. Generally I don't eat the Burdick's truffles because they are too boozy for my taste, but these has a nice pear flavor and only a hint of heat from the alcohol. Perfect. 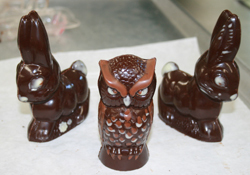 Our next activity was unmolding our bunnies, squirrels, owls, and such. They came out great - shiny exterior and well-tempered, snappy chocolate. Only one of the 30 molds got stuck and after a few minutes in the freezer, that one popped out too. I don't plan on making many molded chocolates, but it is good to know how to do because that's what my nieces will like. After the unmolding, Michael showed us how to roast and candy hazelnuts in a single step. 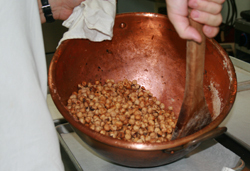 Simply melt sugar, water, flavorings and salt in a copper pot, and toss in the nuts. Stir over low heat until the nuts smell toasty and then stir off-heat until the sugar crystalizes. Chill the nuts for an hour, toss them in melted chocolate until the chocolate crystalized, toss again in melted chocolate until it crystalizes, and finally toss with cocoa powder to coat. This method creates a thin coating of chocolate that balances nicely without overpowering the crunchy candied hazelnut inside. This can be done with any kind of nut. Our final activity was "eyeing the mice," also known as putting the eyes and noses on the mice. David showed us how to make paper cones, fill them with chocolate, and pipe on teeny-tiny eyes and noses on our little mice. I use the term "mice" loosely because some of ours ended up looking like pigs, bears, elephants, and unidentifyable blobs. While we headed out for a break following but lunch in the cafe, the packing crew packed our pounds and pounds of finished chocolate confections into boxes and bags. After lunch we each picked up our VERY LARGE box and headed for home. On behalf of our whole group I'd like to thank Michael for inventing chocolate camp and teaching all of our lessons. Thanks to Cassandra, Jodie, David, and the rest of the crew who assisted us with our projects. We couldn't have done it without your help. Thanks to everyone else at the production faciltiy for giving us samples, letting us ask questions, photograph your work, and generally interrupt your peaceful kitchen. A big thank you to the packing crew who packed our chocolates so beautifully, and finally, thanks to everyone at the restaurant who made and served us such wonderful meals and snacks.